defines the technical basis for the existing condition. Constellation Technology is structured to take advantage of our core competency of Measurement – Analysis – Solution . With the foundation of a world class Analytical Laboratory and a wide range of subject matter experts, we provide implementable solutions with minimum risk and maximum return on investment. Constellation Technology has the proven technical capabilities and subject matter experts to perform Measurement – Analysis – Solution services. Our team of scientists and engineers are ready to help solve your complex issues. Normal business hours are Monday - Thursday 8:00 AM to 4:00 PM Eastern (US) Time. Constellation Technology Corporation is located in the Tampa Bay Area of Florida, conveniently located near Tampa International Airport, as well as the St. Pete-Clearwater International Airport. 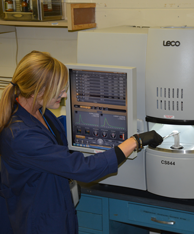 Constellation Technology’s Laboratory and Offices are maintained in the Pinellas County Young/Rainey Science Technology & Research (STAR) Center. Copyright © 2019 · CONSTELLATION TECHNOLOGY CORPORATION.